The “Lord of the Rings” movies may have brought this unique architectural style into the public consciousness, but you don’t have to be a fantasy fan to appreciate the beauty of a so-called “hobbit house.” In the classic hobbit house, rounded, drooping roof edges echo their natural surroundings, while an eyebrow roof line accentuates the ivy-laced walls and beckons visitors up the path to the front door. 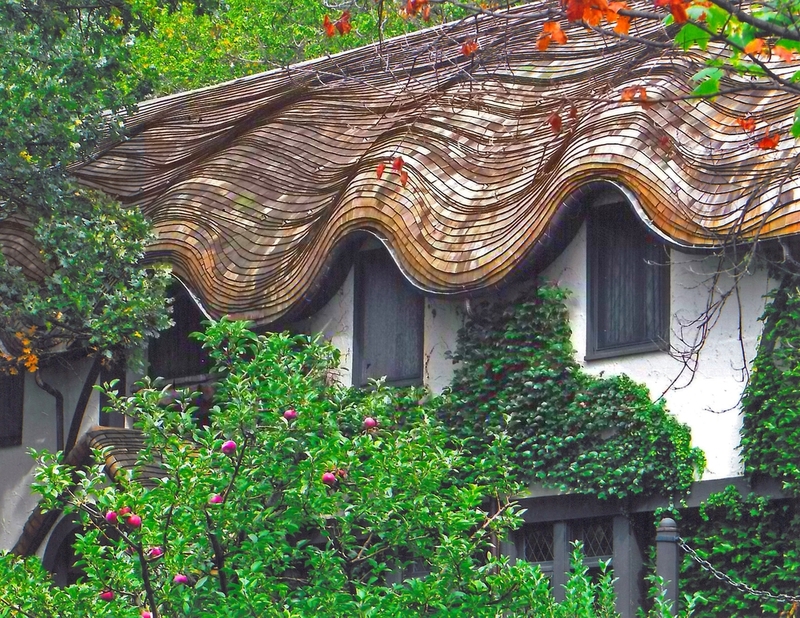 Hobbit house roofs aren’t just a product of the movies. With Custom Shingles, you can build your own “Lord of the Rings”-style home using our cedar roofing products. We’ve been working with these types of homes since the 1980's, and will be happy to take you step-by-step through the build process. Keep browsing our website to learn more, or check out our Portfolio Gallery to see some of the work we’ve done for demanding customers around the world. Recreating the unique rolling look of a hobbit house requires specially shaped shingles. Custom Shingles provides pre-bent shingles that can be used to form dramatic eaves, gables and other architectural features. Mild-to-heavy coursing adds to the effect, giving the appearance of gentle waves that mimic the surrounding landscape. All of our products are made to order in our Florida facility, and are available in several different wood and stain options to suit the needs of any homeowner. Cedar shingles are a great choice for any hobbit house or “Lord of the Rings”-inspired cottage. Cedar is long-lasting and can be treated for additional durability and weather resistance. It’s also energy-efficient, and has natural insulating properties that can help you save on heating and cooling expenses over the course of the entire year. A hobbit house of your own is just one of the many options available to you with Custom Shingles’ pre-shaped cedar roofing products. In fact, the possibilities are practically limitless when you combine our design expertise with the versatility and charm of cedar roofing. We can install waved valleys, rakes, hips and other geometric features that bring your dreams to life. Whether it’s a new build, a renovation to an existing home or an historical restoration, count on the Custom Shingles team for artisanal quality and design innovation.